Just short walk from one of Amagansett's most coveted ocean beaches, a newly constructed traditional home is in the works from Farrell Building Company . 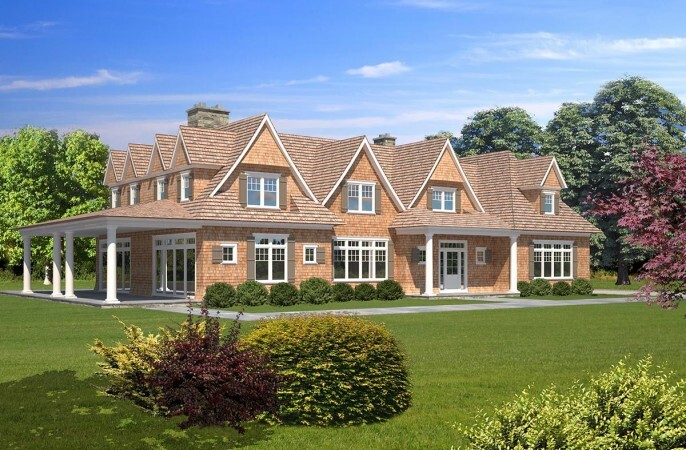 With all the amenities and finishings you've come to expect from Farrell, on 1.2 acres, the home will offer approximately 7,000 SF of living space in the combined first two floors, with additional living space in the finished lower level. Boasting decadent bedrooms, plentiful bathrooms, a high-end gourmet kitchen, formal dining room, formal living room with fireplace, attached garage and a heated gunite swimming pool and spa, this home has everything your need to maximize your summer. East of East Hampton is the small hamlet of Amagansett. This unique enclave is for those who place a high value on enchantment and appreciate the subtle pairing of quiet with the understated luxury. The drama here is nature's own, starting with the Amagansett Wildlife Refuge. Within this 36-acre protected area is one of the Island's very rare undeveloped coastal beaches, which is distinguished by their unique double dune system. The primary dunes are a barrier reef to the Atlantic Ocean. The secondary dunes proliferate with flora, from Cape Cod-like cranberry bogs to rare varieties of orchids. Spend some time looking out on this extravaganza and you will feel like you have found the missing piece to the puzzle. Main Street separates the sprawling farmlands to the north of Amagansett and the Atlantic Ocean to the south. The mix of quaint and chic establishments, plus the legendary Farmer's Market on Montauk Highway, are well-known on the East End and well beyond. For those that live in Amagansett, it is just the neighborhood.